ALGÉRIE CAMP DE RÉFUGIÉ SERBE Á MILIANA (PREMIÉRE GUERRE MONDIALE), LETTRE EN FRANCHISE, RRR ET TB, SIGNÉ PIGERON. 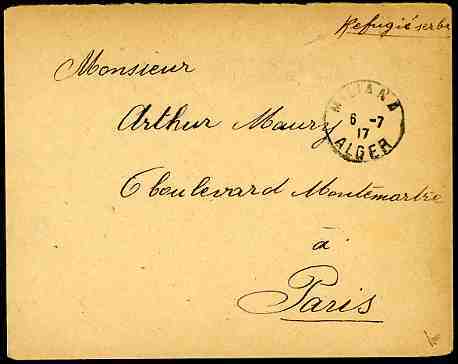 SERBIA REFUGEE CAMP in ALGERIA: "MILIANA ALGER 6.7.17" c.d.s and manuscript "REFUGIÉ SERBE" on postage free cover to Paris send by a serbian refugee of world war I "Milorad Roujitchitch éléve á l´E P S de Miliana Algerie" . Very fine and rare, signed by the french expert Pigeron.